German Interior Minister says the country should appoint anti-Semitism commissioner to counter hate speech against Jews and Israel. Germany should appoint an anti-Semitism commissioner to counter growing hate speech against Jews and Israel from both its home-grown far right and the immigrant community, the interior minister said Sunday, according to AFP. 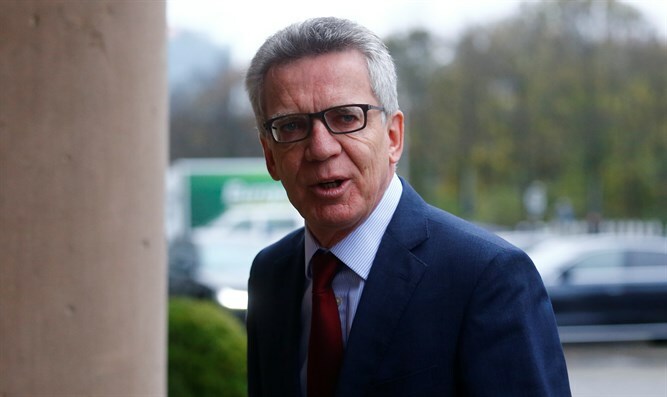 The minister, Thomas de Maiziere, spoke days after protesters in Berlin burnt Israeli flags during a protest against the U.S. decision to recognize Jerusalem as the Israeli capital. "Every criminal act motivated by anti-Semitism is one too many and a shame for our country," de Maiziere, the caretaker minister since inconclusive September elections, told the Bild am Sonntag newspaper. "Anti-Semitism must never again take hold in Germany," he added, pointing to a rise of "derogatory remarks, inappropriate jokes and discriminatory behavior against our Jewish citizens". He condemned the recent flag-burnings as "the symbolic destruction of a country's right to exist", while Defense Minister Ursula von der Leyen also said such expressions of hate were "unbearable". De Maiziere said when Germany has a new government -- which Chancellor Angela Merkel's conservatives and the center-left Social Democrats are now discussing -- it should appoint an anti-Semitism commissioner. Last week, about 2,500 people demonstrated in Berlin against President Donald Trump’s decision to recognize Jerusalem as Israel’s capital and burned one Israeli flag. German Justice Minister Heiko Maas later condemned the incident and said there was no place for anti-Semitism in Germany. “Any kind of anti-Semitism is an attack on everyone. Anti-Semitism must never be allowed to have a place (in society) again,” he stressed. German Foreign Minister Sigmar Gabriel also reacted to the Israeli flag burning and said that while criticism of Trump’s decision was understandable, people had no right or reason to burn the Israeli flag, stir up hatred against Jews or question Israel’s right to exist. He said whoever did that was “taking a stand not only against Israel but also against the German constitution” and Germany would not tolerate that. Merkel's spokesman Steffen Seibert said last week that, although Berlin opposed the move by Trump, it strongly condemned protests where "hatred" of Israel and Jews was expressed. On Friday, President Frank-Walter Steinmeier also declared himself "shocked and shamed" by the incidents and warned that anti-Semitism was still "showing its evil face in a variety of ways". Steinmeier stressed Germany's responsibility to learn "the lessons of two world wars, the lessons of the Holocaust, the responsibility for the security of Israel, the rejection of all forms of racism and anti-Semitism". This was "non-negotiable" for everyone who lives in Germany, no matter where and when they were born, he added. He added that "the solution to the status of Jerusalem can only be determined by direct negotiations between the Israelis and the Palestinians. That is why we reject any step that could lead to an escalation between the two sides. Germany remains committed to the two-state solution in the Middle East." Following the declaration, German Chancellor Angela Merkel was one of several European leaders to express her opposition to the move.